Watch a video about Jane Austen's life and her novels. Explore objects from Jane Austen's house in Chawton, Hampshire, where she spent the last eight years of her life. Watch clips from a TV production of "Pride and Prejudice". Watch a video clip about what Jane Austen wrote about love and happiness. See a trailer for a TV version of Jane Austen's novel "Emma". Watch a trailer for a TV production of Jane Austen's novel "Persuasion". See people dressed in Regency fashions walk through the streets of Bath. Watch a dance from a TV adaptation of "Pride and Prejudice". See dancers in Regency costume perform a dance from Jane Austen's time. 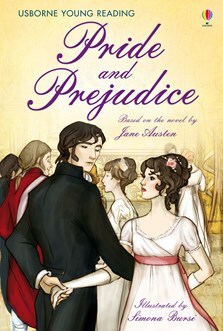 A delightful retelling of the much-loved classic by Jane Austen. The Bennett sisters are coming of age and it’s time for them to find husbands and take their place in high society. But will everything end up as they hope? Part of the Usborne Young Reading Level Three series aimed at children ready to tackle longer and more complex stories. This adaptation succeeds with young readers experiencing an Austen story for the first time as well as with readers familiar with her sensitivity and subtle wit. 5 out of 5 Regency Stars! I loved everything in the story. I still can`t believe that Ada married RICHARD.